Meet Pepper, Aldebaran's New Personal Robot With an "Emotion Engine"
French robotics company Aldebaran unveiled its newest robot, a friendly humanoid named Pepper that seems determined to make everyone smile. Pepper talks, gesticulates, and zips by on wheels. And it has an “emotion engine,” designed to understand how people are feeling and react accordingly. Aldebaran built the robot for SoftBank, the Japanese telecom giant, which plans to start selling it to consumers in Japan next February for 198,000 yen, or about US $1,900. The robot will be produced by Taiwanese electronics manufacturer Foxconn, which makes iPhones and other Apple products. Pepper won’t help you cook dinner or clean the house. It’s conceived as a communication and companion robot. And apparently it loves to tell jokes. “Pepper, please explain some of your functions,” said SoftBank chief executive Masayoshi Son as he introduced the robot at an event in Tokyo. In the demonstration, the robot moved its body so smoothly that one observer later said it was as if there were a small person inside of it. But Pepper’s actions seemed to have been carefully pre-programmed, so it still remains to be seen how it will behave in real environments. Son said a lot of effort went into developing the robot’s software. The main goal was making Pepper able to recognize people’s emotions by analyzing their speech, facial expressions, and body language, and then deliver appropriate responses. If you look sad, say, Pepper will try to cheer you up by playing one of your favorite songs. 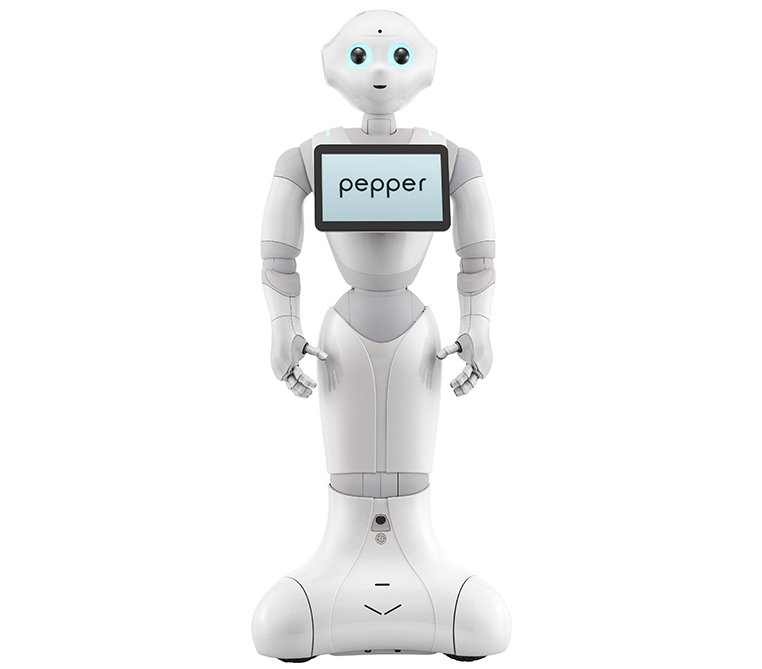 Starting tomorrow, people can meet Pepper at two SoftBank stores in Tokyo, and more will follow, he said. Photo: SoftBank/Aldebaran Robotics Bruno Maisonnier from Aldebaran and Masayoshi Son from SoftBank with Pepper in Tokyo.Pepper’s creators know they can’t program the robot to behave perfectly in all situations, so they wanted the robot to learn on its own. According to Son, the robots deployed at SoftBank stores will start collecting data on their interactions with people. When Pepper tells a joke, it will observe if people laugh, for example. The robots will upload their data to a cloud-based repository. This “cloud AI,” as Son called it, will use the combined data to improve Pepper’s behavior. “The robot is going to evolve through this collective wisdom,” he said. The data collection will continue when Pepper is used in homes. In one example described in the presentation, if the robot reads a book that many kids like, it may suggest that same book to more kids. But Son was careful to emphasize that the cloud system will not collect private information. As Pepper’s technology improves, SoftBank envisions the robot entertaining people at parties, playing with children, and keeping company to the elderly. Bruno Maisonnier, founder and CEO of Aldebaran, said that his company worked for more than two years on the project. The result is an impressive feat of engineering. 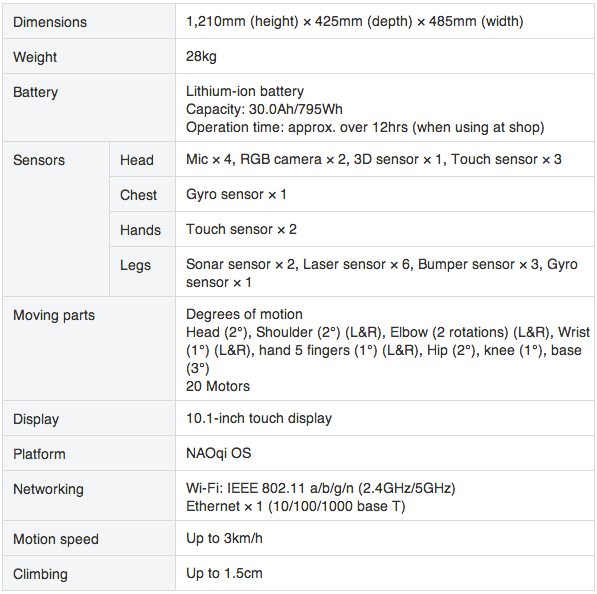 The robot is 1.2 meter tall and weighs 28 kilograms, and it carries a 10.1-inch touch screen on its chest. It has 20 motors and can move its head, shoulders, elbows, wrists, fingers, hips, and knees. Aldebaran developed a proprietary mechanism to measure electrical current consumption on each motor, allowing the robot to detect forces on its body. In addition, Hall effect sensors are used for motor positioning. The robot’s head has four microphones, two HD cameras (in the mouth and forehead), and a 3-D depth sensor (behind the eyes). There’s a gyroscope in the torso and touch sensors in the head and hands. The mobile base has two sonars, six lasers, three bumper sensors, and a gyro, and it can drive at up to 3 kilometers per hour [see full specs below]. The robot spoke only in Japanese at the demo, but it can also speak English, French, and Spanish. Pepper’s battery operates for up to 12 hours, though in the future that may change if Aldebaran equips the robot with legs, a possibility that Son mentioned at the event. Aldebaran has been working on a bipedal robot called Romeo that’s of a similar stature, so a walking model may not be too far off. The success of Aldebaran’s first robot, NAO, seems to have helped guide the design of the new humanoid. There are more than 5,000 NAOs in 70 countries, used in research, education, and to help sick kids. Maisonnier said Pepper is different from Nao in size and appearance, but the two robots share many similarities. The two rely on the same software foundation, called NAOqi, which tries to make robot programming easier. Applications developed for NAO are expected to be compatible with Pepper, and vice versa. Aldebaran plans to open up Pepper to developers (through an API), who’ll be able to create applications that they can offer to other users, much like our smartphone apps, continually expanding the robot’s capabilities. This robots app strategy is similar to that adopted by other robots such as NEC’s PaPeRo and Fujisoft’s Palro, which also try to benefit from the rapid adoption of mobile applications. Aldebaran is planning a developers conference in September to explain in detail the robot and the SDK it will release. “The goal is to have a community of people who want to develop applications to help the robot grow,” Maisonnier said. And he wants not only programmers to participate, but also artists, musicians, and graphic designers.